There are a few essential things you need to before you fly your drone. DID YOU GET a drone for Christmas? If you did, you’re probably eager to start flying it as soon as possible. However, you should take a few moments to research the important things you need to keep in mind before you take your new toy to the skies. In December 2015, regulations came into effect to govern the use of drones in Ireland. So, it’s essential to know what’s allowed and what isn’t before you take flight. The Small Unmanned Aircraft (Drones) and Rockets Order requires all drones weighing over 1kg to be registered with the Irish Aviation Authority. However, drones below 1kg can be flown without a permit, provided they remain no more than 15 metres above ground level and no more than 300 metres from the operator. If you need to register your drone, you can do so by visiting the IAA’s website, which asks you to sign up to Asset, its online terrain mapping system, and register your drone and location details. Any owners under the age of 16 need to be registered by a parent or legal guardian. Registration will cost €5 and will cover users for up to two years. There’s no limit to the number of drones you can register. Now, when and where can I not fly my drone? If it will be a hazard to another aircraft in flight. Over an assembly of 12 people or more. Further than 300 metres from the person operating the drone. Within 30 metres of any person, vessel or structure not under the control of the person operating the drone. Closer than 5 kilometres from an aerodrome. Over 400 feet above ground level. In civil or military controlled airspaces. In restricted areas (such as prisons, etc). Unless the person operating the drone has permission from the landowner for take-off and landing. These regulations apply everywhere in Irish airspace, regardless of whether it’s your private property or not. The IAA advise that there may be privacy or trespass laws that should be taken into consideration before flying a drone. How can I tell if an aerodrome is nearby or where a restricted airspace is? The IAA says that it is the responsibility of the person operating a drone to assess the area in which they intend to fly. While the IAA’s Asset tool can be used to establish the location of licensed aerodromes within Ireland, it is essential for the person who will operate the drone to visually inspect the area in which they intend to operate for aircraft activity. The Asset tool can also be used to determine controlled and restricted airspace areas. What if I want to fly my drone outside the above limits? If you want to fly your from outside of the prescribed limits, you must apply for a Specific Operating Permission (SOP) from the IAA. In order to get an SOP, you must first attend a drone safety training course and produce an operations manual that is acceptable to the IAA. A list of these training facilities can be found here. Do I need permission to fly a drone with an inbuilt camera? Irrespective of whether your drone has an inbuilt or mounted camera or not, the same conditions apply as listed above. Is there a minimum age for operating a drone? 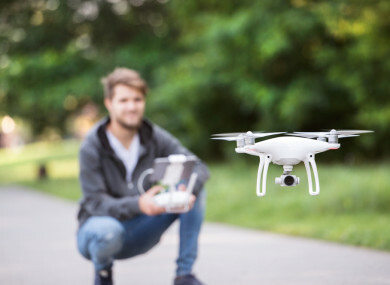 While there is no minimum age for operating a drone in aviation regulation, the IAA advises that age guidelines indicated by drone manufacturers are followed. And, as stated above, if you are under the age of 16 you must get a parent or guardian to register the drone. Drones are easier to fly than model aircrafts because of the number of safety features built-in. However, just because something is easier to use doesn’t mean you don’t need to practice. Resist the temptation to fly as far or as high as you can and instead become accustomed to the controls and handling. If something does go wrong – and you should always keep that possibility in mind – you may be able to avoid crashing or causing damage if you’re more experienced. Make sure you have a lot of space, and it isn’t windy or stormy when you’re starting out. Email “Did you get a drone for Christmas? Here's everything you need to know before flying it ”. Feedback on “Did you get a drone for Christmas? Here's everything you need to know before flying it ”.